Perched in the foothills of the Himalayas in the state of Uttarakhand, Corbett National Park is an ideal territory of a riveting population of royal Bengal tigers and many such striking wildlife species. Among the various safaris that can be carried out here, Jeep Safari in Corbett is one of the best options to witness wilderness and be in awe of beautiful panorama of the park. The open pastures, wooded areas and assortment of flora and fauna species in Corbett National Park offer scores of opportunities for wildlife viewing while on a jeep safari at Corbett Park. Let us explore the full monty of jeep safari in this empyrean for wildlife freaks. Why to Choose Jeep Safari in Corbett? There are several points that give Jeep Safari an extra edge over other modes of excursion in the park. 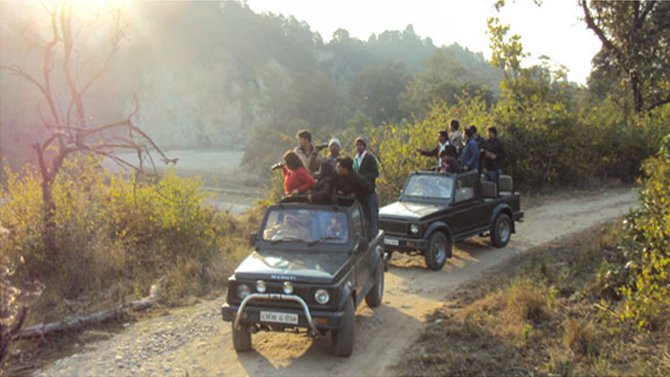 Below-mentioned are some of the major advantages of Jeep safari in Corbett National Park. 1. 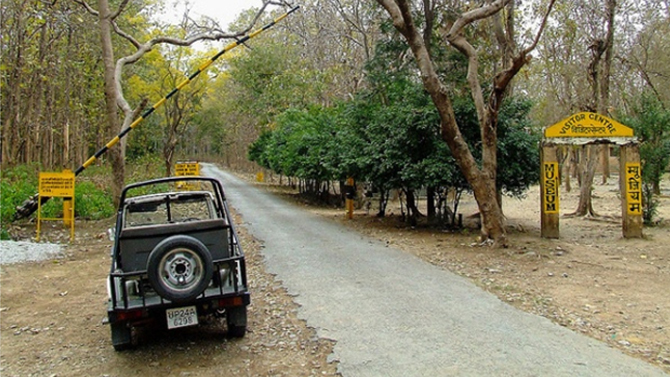 Safest Mode of Excursion: Jeep Safari is certainly the safest mode to explore the wilderness of the Corbett woods. Jeep has a speed and thus it will make you feel safer in the areas prone to animal attack. Thus, there is minimum danger of animal attacking you in jeep safari. In case of any danger, you can speed up the vehicle and get out of the area in no time. 2. The Comfort Element: Exploring the exotic flora and fauna of Corbett while sitting in a comfortable jeep makes this safari worth preferring. Jeep Safari tenders mesmerizing vistas of forests in a completely relaxing ride. The tourists can savor the views while sitting on a comfortable seat offering a unique sense of extravagance in the midst of nature’s grandeur. 3. Covers More Area: It can be considered as one of the most enticing facts about Jeep Safari. You can cover more area in comparison to animal safari as there are no chances of jeep getting tired on hungry as it may happen in the case of animal safari. 4. Time Saving Exploration: Most of the travelers usually have certain restrictions of timings. Therefore, time consumption is a big advantage provided by the jeep safari. You can cover more region of park on jeep in lesser time in comparison to other modes of safaris. 5. More Flexibility in Timings: Jeeps Safari paves a way for flexibility in planning a schedule. 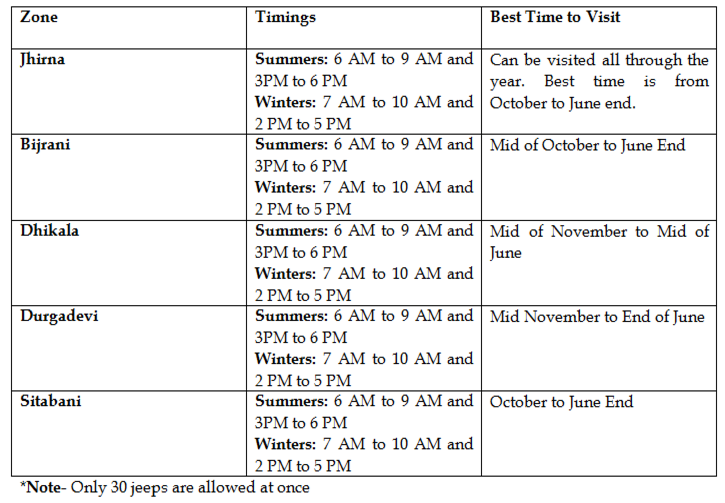 The itinerary can be altered as per the convenience. On the other hand, in case of animal safaris, you have to consider the routine of the animal and can carry out safari as per the routine of the animal. 6. More People Can Travel at Once: Jeep can accommodate up to six travelers at once. Thus, it becomes the best option to choose while on the tour with friends or family. Other safaris cannot make this many people travel at the same time. Hence, you can also save money in hiring more animals for safari. One jeep can boast it all. 1. Jeep Safari at Bijrani Zone: The Jeep Safari in Bijrani Zone starts from Aamdanda Gate. This gate is positioned almost 2 kilometers away from Ramnagar. The zone is renowned for boasting royal Bengal tigers, elephants and varied avifauna species. Bijrani Zone is open for the visitors from mid of October to the end of June. 2. Jeep Safari at Jhirna Zone:Jhirna Zone is situated approxiamately 16 kilometers from the city of Ramnagar. The zone remains open for the tourists all through the year. Located on the southern part of Corbett Park, Jhirna Zone incorporates dry decidous forests with immense open grasslands. These grasslands offer intriguing visibility of wild animals. The wildlife lovers can explore the sights of wild animals from the machans set up in this zone. Sheer cliff edges and vast streambeds render fine opportunities for bird watching. 3. Jeep Safari at Dhikala Zone: Dhikala is the largest zone of the park and includes various snug forest lodges that allow the wildlife buffs to relish a comfortable stay in the middle of wilderness. The zone is popular for its invigorating natural beauty. The major fauna species found in this zone are Bengal tigers, deer, elephants, chital, cobra, etc. The jeep safari in Dhikala Zone for general tourists is not allowed by forest department. Only the visitors having night stay permit in Dhikala Forest Lodge can carry out Jeep safari in this park. 4. Jeep Safari at Durgadevi Zone: This zone is located almost 28 kilometers from Ramnagar. It is at the real part of Ramganga River. The zone lies on the northeastern boundary of Corbett National Park. Popular for Mahseer fishes, Durgadevi Zone offers the views of various bird species as well. Some of the major fauna species that can be spotted en route are long tailed broadbill, bar tailed tree creeper, slaty blue flycatcher, black chinned Yuhina, crested laughing thrush, grey-headed fishing eagle, etc. The tourists have to stay overnight in this zone to carry out Jeep safari. 5. Jeep safari at Sitavani: Positioned about 35 kilometers from Corbett Wild retreat, Sitavani is within the reserve forest area of Ramnagar Forest Division. This region includes lush verdant forests of Sal and mixed flora with open grasslands and streambeds. The Jeep Safari in this zone takes the tourists to the ancient and beautiful temple of Goddess Sita. The zone is part of Corbett buffer zone and does not require any special permit for safari. Sitavani forest renders heaps of birding opportunities. the forest is famous for wild elephants and tigers. Other exotic fauna species that a traveler may come across are sambar, porcupine, barking deer, etc. During safari tour, keep the mentioned IDs with you. These proofs are checked at the gate. It is important to book the safari in advance. Maximum 6 persons can accommodate in one jeep along with one government guide. Booking gypsy in advance is beneficial as only 30 gypsies are allowed in a day. Specific paths are maintained for vehicle to make the guest watch wildlife. Never insist the guide to drive off the track as you may lose the track inside the forest. Enjoy jeep safari in Corbett and put unforgettable experience of wildlife and nature’s bounty in your kitty!